Unique, Enduring, and Luxurious. Exactly! 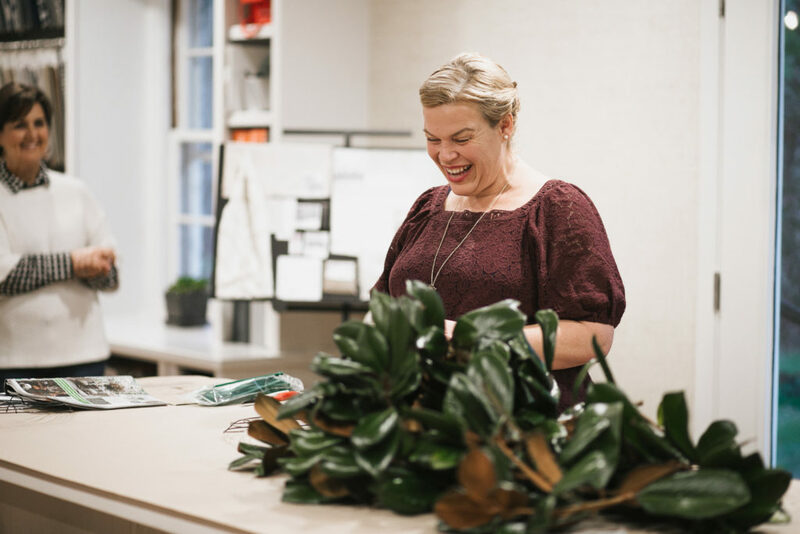 As the weather finally turns cooler and our thoughts turn towards the holidays, we wrapped up the 2018 Southern Studio at Sunset series by welcoming Erin Weston of Weston Farms to lead an Antiquity Wreath Making Class. 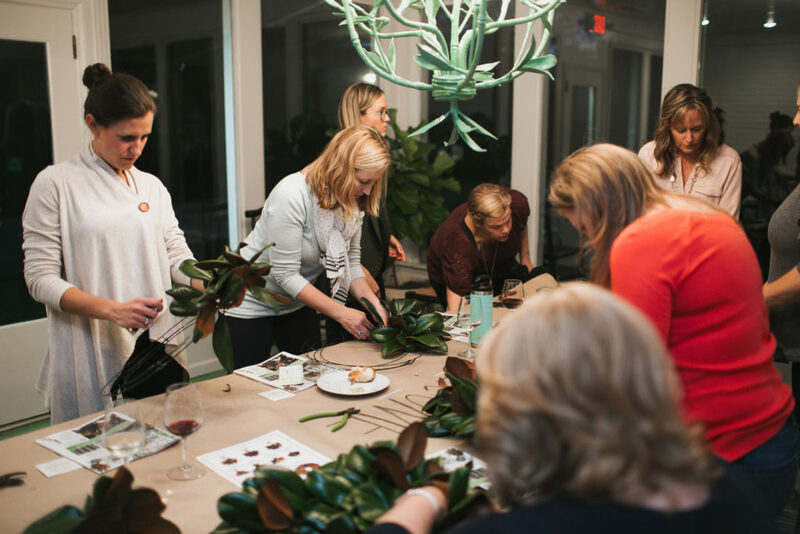 It was such fun to fill the studio with clients and friends for a night of food, wine, laughter, and magnolias – what could be more Southern than that?! Southern Studio loves to incorporate local artists into our designs. In 2002, Erin Weston relocated from NYC to her home state of North Carolina to become a farmer, combining her UNC Chapel Hill fine arts degree with the family business. Weston Farms now has more than 10,000 trees and their signature wreaths, garlands, and fresh Magnolia arrangements are shipped nationwide. 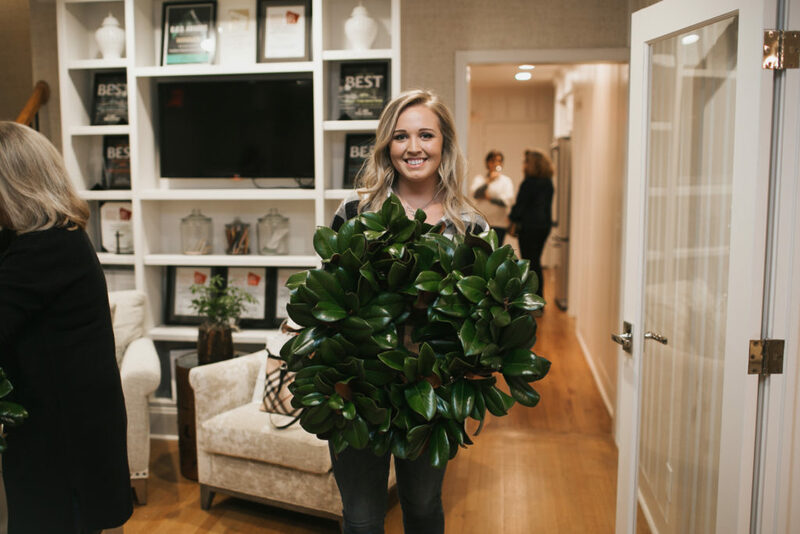 Erin’s work has dazzled local markets, national interior designers and presidential florists alike, and has been featured on the cover of House Beautiful, in Southern Living Magazine, HGTV, Time Warner Leisure Channel as well on display at The NC Museum of Art. It was such a treat for her to share her talent and enthusiasm with us! Erin’s vision to “grow a unique, enduring luxurious product on her family farm” is a perfect collaboration with Southern Studio. After a brief demonstration by Erin in wreath making technique, we got to try creating a magnolia wreath to take home. 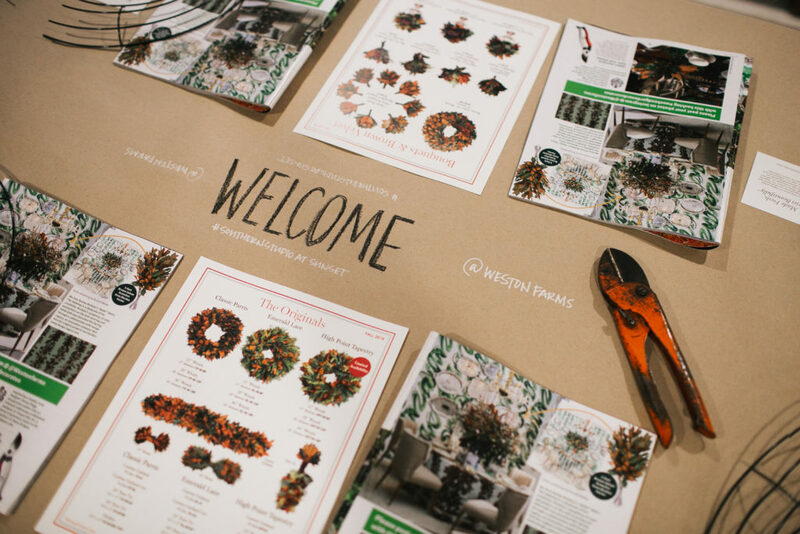 Everyone started with a huge bag of fresh magnolia, a wreath form, florist wire, clippers and varying levels of confidence to dig in. And while every wreath was beautiful, each was just a little different. Isn’t that fabulous? 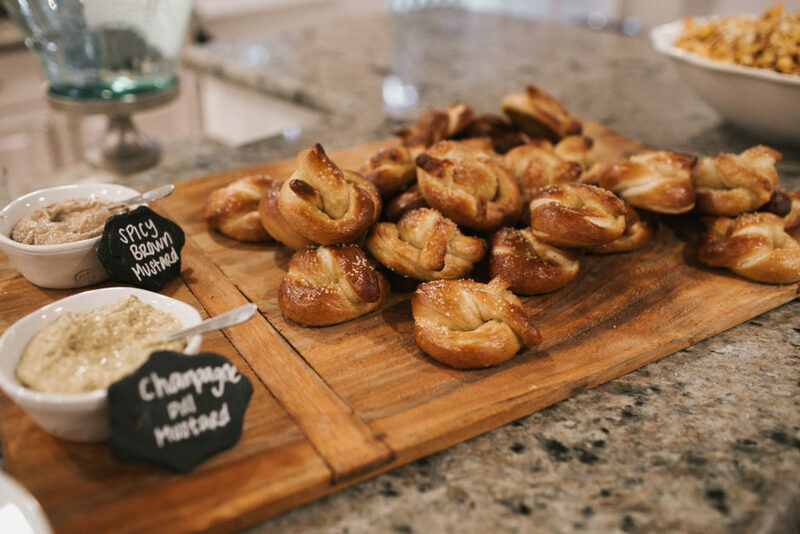 Sipping cider, a pot of chili on the stove, pretzels, caramel corn, pumpkin cookies, and an evening of cheer made for a perfect fall night and a wonderful way to head into this season of hospitality. Thank you to all who shared the night with us. Here’s hoping all of our homes are filled with family, friends and laughter this Fall! Leave a Comment Comments Off on Unique, Enduring, and Luxurious. Exactly!